Holy crap, someone is opening a new record store? Who in their right mind would open a record store? And in New York of all places, with its exorbitant rents! Didn't these guys see what happened those who came before them? Well, this is different. 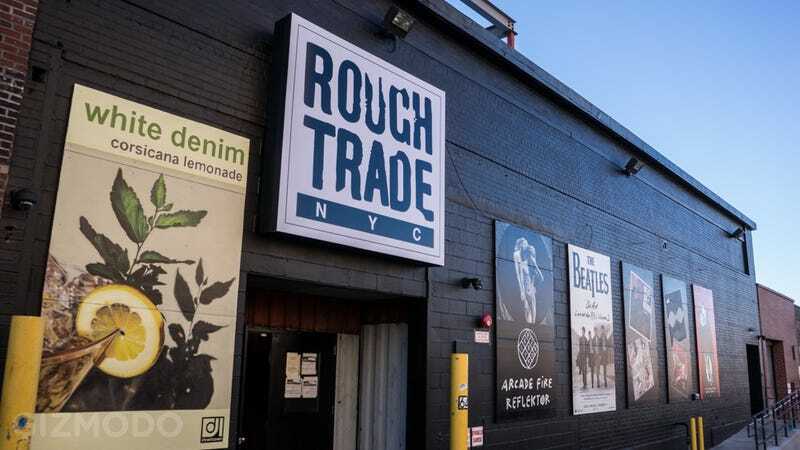 Yesterday, Rough Trade NYC opened its doors on North 9th Street in Williamsburg, Brooklyn, just blocks from rows of expensive condominiums that have sprung up on the East River, overlooking the Manhattan skyline. The store and concert venue is an offshoot of the legendary London record stores, which have been around since the 1970s. Rough Trade's record label was sold to BMG a decade ago amidst financial problems, and is now part of indie conglomerate Beggar's Group. Music industry naysayers are right to question why you'd open a massive record store in one of New York's most expensive neighborhoods. So how does Rough Trade plan to compete with the technological forces that brought down both music stores and a bulk of the underlying industry? First of all, Rough Trade is more than a Records Shoppe—it's a music outpost, housed in a 15,000-square foot warehouse that once stored film props. Inside, the store is compartmentalized, like a market, into smaller individual shops. The composite revenues from each of the businesses could be enough to sustain a thriving physical space for music to live. We visited on opening day, and here's what we found. Record collectors who used to frequent the cavernous record stores of yore are going to feel right at home as soon a they walk in to Rough Trade's huge space. Aisles upon aisles of CDs and vinyl records for sale. Not as many as you'd see in a music mega mart like a Virgin Megastore or in legendary independent chain Amoeba Music, but a respectable amount. Rough Trade has a solid selection, including a combination on old favorites, as well as some well-curated, deeper cuts. The store's layout is divided into two floors, with circulation spaces made from old shipping containers. Many of them are still rusty and rough to the touch. The containers reinforce the idea that the store is actually made up of many separate spaces, which all add up to a giant barge of tunes. Back behind the retail store front, there's a 250-person capacity music venue with a full bar. Lots of hot bands have signed on to play, including legendary New York City impressionist punks Television. Tickets to many shows are already sold out. More than just an add-on gimmick, the venue—and especially the bar—could help keep the retail operation in the black. In one corner of the retail store, there's a little instrument showroom curated by Main Drag Music, a Williamsburg staple located about 10 blocks south of the new Rough Trade store. The corner's got some of the coolest new boutique stuff out there—including hot new products from the likes of Moog, Electro-Harmonix, and Keith McMillen Musical Instruments. Upstairs, Rough Trade stocks a selection of music, design, and pop culture books. It's a bit of an Urban Outfitters array— except maybe a little smarter. So, so many copies of Morrissey's autobiography. Rough Trade is also selling dope Bowers & Wilkins headphones, which you can test out while you shop for music. Located up a flight of steel and concrete stairs on the second floor, the "Guardian Green Room" is a container curated by the UK newspaper. The room is outfitted with touchscreen displays that visitors can use to read Guardian music coverage, as well as to communicate with the outside world. It's, you know, a kitschy social and interactive experiment because that's what the cool kids do. So what are we to make of this all? It sure is lovely to see aisles upon aisles of records curated by a legendary team of tastemakers.